Large Amount of Office Furniture for Sale! 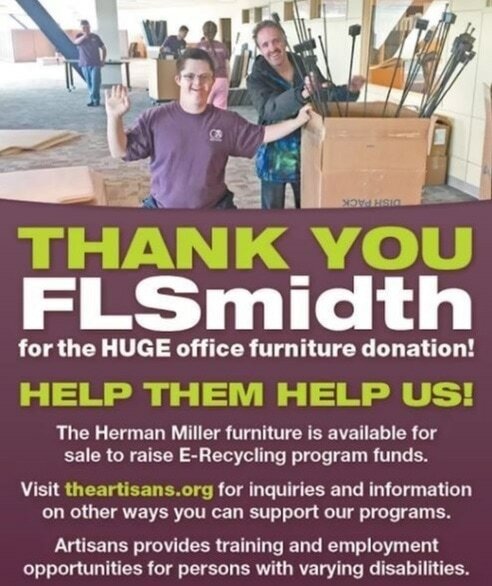 Artisans received a huge office furniture donation from FLSmidth. Items, including high quality Herman Miller Office Furniture pieces are available for sale to community members and businesses. Furniture sales will help Artisans E-Recycling Program. Please fill out Inquiry form below if you would like more information about the furniture available and to schedule an appointment to view items available for purchase. Artisans, in partnership with CyclePoint from Source America, has launched a drop off and pick up E-Recycling service for the Spokane Community and its outer lying areas. We are dedicated to not only providing employment for individuals within our community but to providing a convenient, affordable and safe resource to dispose of or refurbish old electronics. Find out about upcoming Community E-Waste Drop Off Events!